Time-management software -- offline version, originally uploaded by dgray_xplane. Bill Westerman has joined the back-to-paper movement. 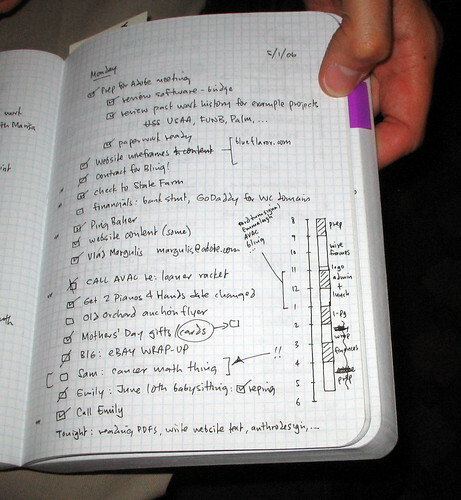 Here are a couple of Bill's ingenous methods for managing his time and to-do lists in his notebook. Bill prefers the Miquelrius notebook (shown here). I have annotated the photo to show how Bill's system works. To see how it works, click here and look at the notes. I went back to paper a year ago as a result of flat batteries and clumsy UI. I run an action list at the back of the book and highlighting of key points of record. My paper's battery never goes flat, I can use it in bright sunlight and drawing is easy. Traditional method to track time, but is this effective? This is the big question here. I use Kanban and Lego chips to keep track of my activities and task management, but which ended up messing things. Later one of my friends suggested me to use Replicon Online timesheet, which is pretty good time tracking tool. Robert Scoble's "living room test"